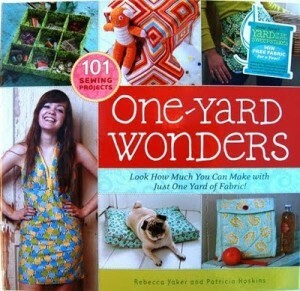 I used the second of my mom’s Christmas gift card bonanza at Barnes & Noble to buy some magazines and One-Yard Wonders by Rebecca Yaker and Patricia Hoskins. I’m in love with it already. It’s been on my wishlist for a while, so when I saw it on display at the bookstore I snatched it up. So many great projects in here, including the fabric dollhouse from UK Lass in the US. Now I definitely need to make that. While I’m recovering from this bug (yesterday was my first day out! I made it 2 hours then came home and slept for 3! ), I’ve been catching up on the blogging universe. I am woefully behind on what’s happening out there in the blogosphere. First, I was checking out Heather Ross’s blog, and I saw a post called “The Library Skirt.” Grabbed my attention right away. She had been part of a craft series at NYPL called Crafternoon, which is completely new to me. And now I will be attending when it starts up again in February. Anyway, the skirt came about as a result of the fabulous old and rare books in the library’s collection, and the gorgeous digital images available for (rights) purchase from their archive. She used one of the images to create fabric at Spoonflower (which I STILL have a gift certificate for from my 30th) and make a super cool skirt (which I have the pattern for since I have her book Weekend Sewing). For the series, Crafternoon gathers authors of craft books and crafters together at the library to raise money for the library and craft in the midst of the awesome architecture of the building. How cool is that?! I’m all over that this year. Then I was over at Handmade by Alissa reading about the Modern Quilt Guild. Chapters of young, non-traditional quilters are sprouting up all over the country, inspired by her chapter in LA. And there’s one starting up in Philadelphia, run by Julie from Jaybird Quilts. So I emailed her this morning to get on board. Philly is a little further away than NYC for me, but only by about half an hour. Completely manageable, and finally a quilting group of my peers! So that is a lot of crafty updates, but it’s shaping up to be an exciting start to a crafty year!